What would you guess is the germiest thing in your house? The trash can? The toilet? Dirty Towels? It’s actually — yuk — the kitchen sink. In fact, the entire kitchen is a hotbed of bacteria, according to a study by the Hygiene Council, a group of global health experts. The room plays host to half of the top 10 germiest areas in your home, even though most people say they regularly clean the kitchen. Fortunately, getting rid of your kitchen germs is easy. 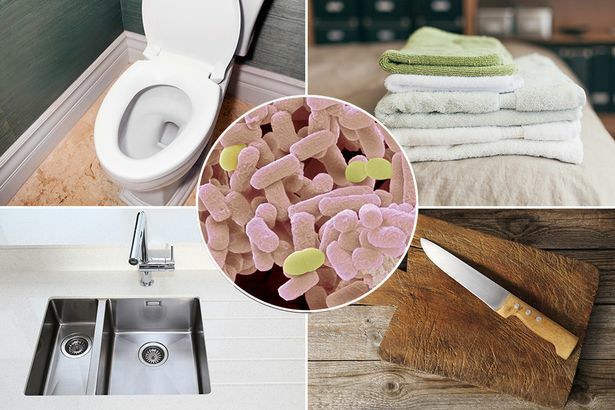 Here are the top five germ-prone areas — plus quick tricks for cleaning them. Banish the bacteria: Simply spray your basin and drain with disinfectant every night after cleaning up the dinner dishes. No need to wipe! The thing you rely on to clean your kitchen may be sabotaging your efforts. “If you use a sponge to wipe a bacteria-containing area and then use it to wipe countertops and other surfaces, you give germs a free ride around your kitchen,” explains Gerba. Banish the bacteria: Designate one sponge for washing dishes and another sponge or cloth for wiping surfaces. Toss sponges in the dishwasher with a regular load at least once a week (or whenever one touches raw food). Microwaving a sponge for two minutes also kills bacteria. Banish the bacteria: To prevent cross-contamination, use one cutting board for meat, poultry and seafood, and another only for produce. Wash them after every use: Glass and plastic boards can go in the dishwasher, but wood cutting boards need to be washed and dried by hand. You can also apply mineral oil to wood boards every month or two, which helps seal crevices and block bacteria, says Findley. After handling raw meat, most people reach for the faucet to wash their hands. But that leaves bacteria behind on the handle. What’s more, germy sponges and dishcloths are often stored nearby or draped over the faucet. Banish the bacteria: When you spray the sink’s basin, also hit the faucet, the handle and the spigot. Or wipe all faucet surfaces with an antibacterial cloth, says Gerba. Banish the bacteria: Wipe down the handle, drawers and bottom shelf before your weekly supermarket trip, Once a month, take out and wash the drawers with soap and water, letting them dry thoroughly. Busy Bees Cleaning Wellington offer full deep cleans for kitchens, oven, range hood and all kitchen appliances. Our ONE OFF CLEANS are a perfect choice to get your kitchen in top condition.